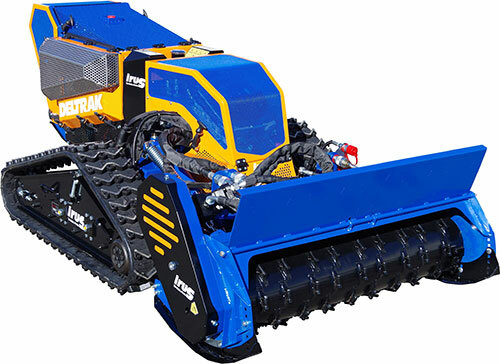 New IRUS Deltrak 2.5 Remote controlled hydraulic tool carrier/mower. Perfect for precipitous slopes, parks, roadside verges and railway embankments. New 38 HP Turbocharged Kubota engine with special engine cooling features. Tilting engine allows weight transfer to the high side track when traversing across slopes while controlling lubrication at safety levels. Large swing up extruded aluminium twin hydraulic oil coolers mounted in the front of the machine, this prevents hydraulic heat transfer to the engine cooling system. Hydraulic cooling fans now have a self cleaning reversing function. Choice of tracks, rubber, rubber / metal inserts with cleats / rubber metal inserts with spikes. Improvements over the previous model are everywhere. Attachments include stumps grinder, forestry mulcher, flail decks, side shift mechanisms, helicopter sling frame, brush protector, rotary broom, sickle bar mowers. And more. Forestry Mulcher, able to mulch a 200mm branch or quickly dispose of a 400mm stump, in one pass. Utilises the new higher capacity and power axial piston pumps and motors while ensuring continuous power provided by the oversized hydraulic oil cooling system. Irus, Made in Germany with eighty seven years of experience.